It is astonishing to see how quickly figs flourish in the soil and climate of our property. The first owner (1983) of this 10 acre site visited the property in 2007 and was also amazed to see how large the figs had become in such a short period of time. The Ficus rubiginosa, the Ficus virens, the Ficus opposita and the Ficus coronata seem to be particularly suited to the conditions on this property. 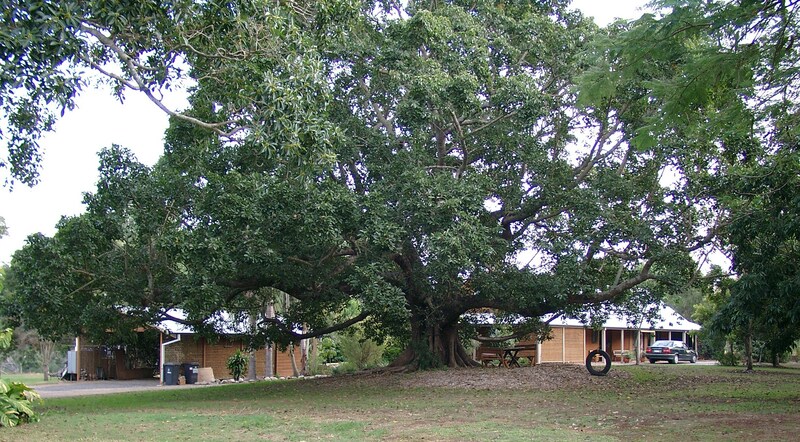 * Graeme Wilson spoke about figs native to this area at a MCCG – Moggill Creek Catchment Group – meeting on 16th July, 2009 and identified this list of trees. The front paddock already contained two small F. rubiginosa and a small weeping fig. We have recently (2010) planted five more in the front paddock – two F. virens, one F. rubiginosa and two weeping fig. In the home ‘paddock’ – which contained a massive virens, a tall F. rubiginosa, a medium F. rubiginosa, a large spreading F. benjamina (var. comosa) and a medium F. lyrata – we planted four F. microcarpa hillii and numerous sandpaper figs which in turn have multiplied since good rain resumed late in 2009. 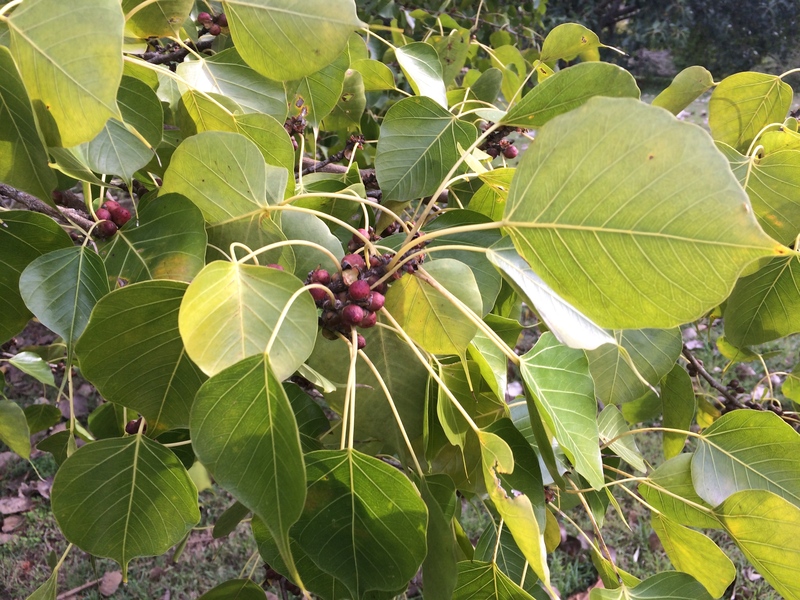 There were some more figs in the side paddock – a medium F. benjamina, a small Ficus benghalensis, two medium F. rubiginosa, 2 large sandpaper (F. opposita – one near the dam wall and one providing shade to the grove areas) and a F. religiosa. Even if it is an exotic the native figbirds (Sphecotheres vieilloti) absolutely adore the figs. Underneath the giant Eucalyptus tereticornis in the side paddock a number of sandpaper figs have more recently self-generated in the shade. Along the river frontage there were already three medium sandpaper figs (down near the pontoon, two F. opposita and one F. coronata). The many sandpaper figs which have self-sown are mainly to be found in the cool gully area along the water-course or other well-watered or shaded areas such as Danny’s garden. These figs are not large and do not have the long invasive roots of the larger glossy-leaved figs. From our experience of buying a home in New Farm that was shielded on the western side by a gigantic Ficus benjamina, it would be unwise to plant the glossy-leaved figs in suburban blocks. They are really only suitable for large public places or acreages. The underground plumbing network for our home in New Farm needed to be drilled through as the roots from the F. benjamina had completely matted over and through various sections. More recently we have had a huge plumbing bill for the main house at Moggill due to the extensive root system of the F. virens. We have not planted any of these big figs near the house but we do value the beauty of the figs planted by previous owners. Instead we hope to use the figs’ vast root systems to advantage along areas of the bank where the soil has been undermined during the last flood – even if the new figs are once again swept away, their roots will be an invaluable assistance to preventing further soil erosion. On this page and the related pages on the 3 sandpaper figs and the 5 glossy-leaved figs as well as on the Weeds page I have tried to consistently use the protocol for scientific names of plants i.e. Genus specific. However on other pages where I am writing in a conversational manner I do not always use a capital for the genus e.g. eucalyptus tereticornis and I may even leave out the genus e.g. (plain) tereticornis. We speak about plants in this way between ourselves and this website is intended as an informal presentation of accurate information. For more information on figs please go to The three sandpaper figs native to Moggill and The five glossy-leaved figs native to Moggill which are subsidiary to this page on the Menu.